ZillowIf you have a wood deck, you'll probably want to seal it every year after cleaning it, for added protection. With summer just weeks away, this is the time to make sure your deck is in good shape for the months ahead. Whether made of wood, vinyl or composite, every deck requires some routine maintenance to keep it looking good and performing well. Tending to your deck annually will ensure that small repairs don't turn into big problems that require expensive reconstruction. As tempting as it may be to fire up the grill, mix a pitcher of sangria and invite the neighbors over, don't even think about it until you have followed these simple steps to ready your deck for summer fun. 1. Inspect It: To start, conduct a thorough inspection of your deck. Look for any loose or damaged boards and railings. Tighten nuts or bolts that have loosened, and remove any protruding nails and replace them with screws. For wood decks, sand any splintered boards to make them smooth. Look for cracks in structural members, and make sure the stair stringers aren't cracked. Take note of any repairs that need to be made, and do those prior to cleaning. 2. Clean It: Next, clean the deck by first giving it a thorough sweeping. Remove any dirt and debris that may have collected in the gaps between the boards, using a putty knife, if necessary. Unless you know what you're doing, a power washer can actually damage a deck. So if you're cleaning it yourself, use a garden sprayer, paint roller or stiff-bristled brush. While mild soapy water is all that is required for cleaning vinyl, you may want to pick up a commercial cleaning product specifically formulated for wood or composite decks. Choose a cloudy day, or a time when your deck is not in direct sunlight. Apply the cleaner according to the manufacturer's directions, allowing it to soak in before rinsing with water. Do a second application if needed. If you have a composite or vinyl deck, your job is done. Sealing is not required or recommended for either, though you can stain some composite decking if it has faded. Check the manufacturer's literature beforehand. 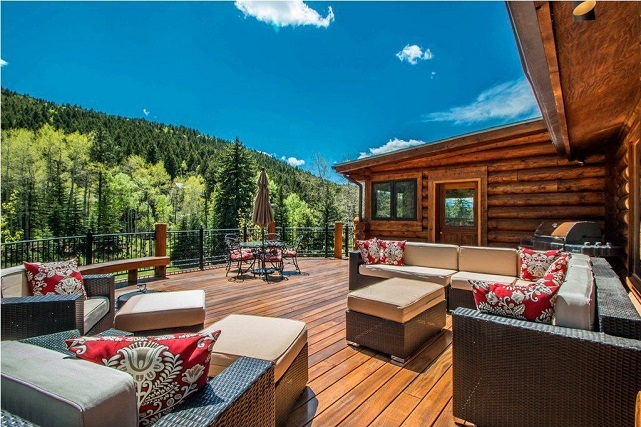 ZillowPlan to seal or stain your deck in two days of moderate weather, with no rain forecast. • Sealer simply seals the wood and lets the natural grain and color show through. • Toner adds just a hint of color to the wood, but still allows the natural wood color and grain to show through. • Semi-transparent stain will tint the wood but still allow the grain to show. You can get semi-transparent stains in wood tones and a variety of other colors, such as green, blue, gray and more. • Solid stain goes on more like paint, completely covering the grain. It protects the wood completely against weather and UV rays. It also can chip and peel like paint, so be sure to prep well. Plan to seal or stain your deck when you will have two days of moderate weather and no rain expected. (Be sure to follow all manufacturer recommendations.) After washing the deck, you'll want to lightly sand the deck with 80-grit paper to smooth the grain. By sanding the wood, you will have raised the grain to absorb the stain or sealer. Apply the sealer or stain in thin coats with a roller, using a brush to get between boards, if necessary. Use a brush or small roller for the deck railings as well as any built-in benches or planters you may have. Let the finish dry completely for two days before using your deck. 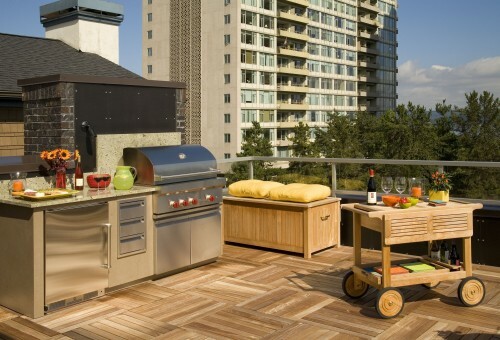 Your deck is now ready for summer, so go ahead -- invite the neighbors over! Bob Vila is the home improvement expert widely known as host of TV's This Old House, Bob Vila's Home Again, and Bob Vila. Today, Bob continues his mission to help people upgrade their homes and improve their lives with advice online at BobVila.com. His video-rich site offers a full range of fresh, authoritative content -- practical tips, inspirational ideas, and more than 1,000 videos from Bob Vila television.